The Hobo Nickel Series of silver rounds available from HotCo and its coining partners at Osborne Mint rolled to its conclusion in 2017 with the late-year release of the Viking Berserker design. In the medieval world and beyond, Viking warriors were some of the most feared foot soldiers on battlefield that stretched well beyond Scandinavia. The 1 oz Antique Viking Berserker Round is now available to you for purchase online from JM Bullion. 9th release in the Hobo Nickel Series and last of 2017! Obverse features a dragon attacking a Viking longship. Reverse includes a Viking Berserker warrior as he swings his axe. Rounds have edge lettering with a unique serial number. Hobo Nickel silver rounds debuted from HotCo and its coining partners in 2016 with all designs created by Mr. The, the working name of Paulo Curcio. Those designs were based upon the Buffalo Nickel with a unique twist for each release. Mr. The created all designs in the 2016 issue, but 2017 brought new blood into the program. The 1 oz Antique Viking Berserker Round was designed by Aleksey Saburov, and represents the last release of the series for 2017. Saburovs design brings to the forefront one of the most unique takes on the Buffalo Nickel, retaining only a few of the basic features of the original circulation US coin that was once a target of Hobo art. On the reverse of the Antique Viking Berserker Round youll find the image of a powerful, imposing Viking warrior ready to swing his axe and take down a foe. The double-headed axe is held over his shoulder while the warrior uses both hands to violently swing the axe. 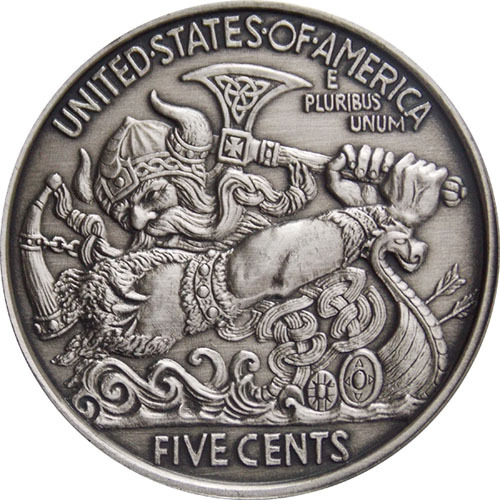 A Viking longship is featured along the bottom, with engravings of United States of America and E Pluribus Unum at the top and Five Cents along the bottom, though the rounds have no face value. 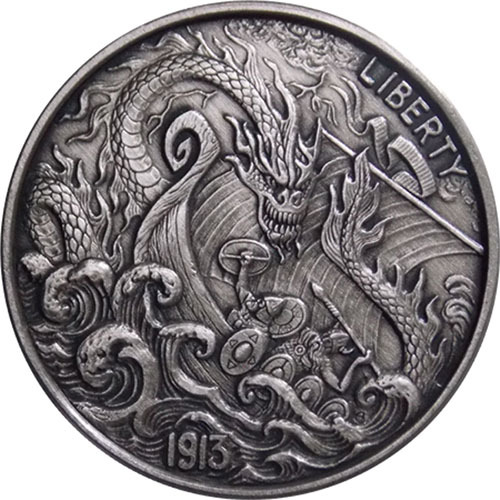 The obverse of the 1 oz Antique Viking Berserker Round includes the image of a Viking longship under attack on the high seas by a water serpent. The warriors onboard valiantly attempt to fight back even as their ship appears doomed. Engravings on this face include Liberty and a year of issue of 1913, the very first year Buffalo Nickels were offered. These 1 oz Antique Viking Rounds arrive in plastic capsules with a numbered Certificate of Authenticity that matches the edge lettering on the rounds themselves. Each round has its own, unique serial number engraved ranging from 1 to 1,000. We encourage JM Bullion customers to reach out to us with questions. You can contact us on the phone at 800-276-6508, chat with us live online, or email us directly.